BROWNSBURG, Ind. (June 15, 2016) – NAPA AUTO PARTS Funny Car driver Ron Capps is riding one of the biggest waves of his career that includes 469 NHRA Mello Yello Drag Racing Series events since 1995. 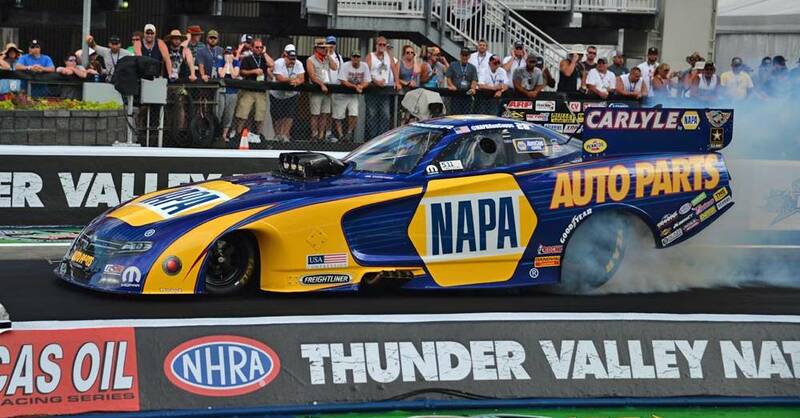 Capps and the NAPA team led by crew chief Rahn Tobler and assistant Eric Lane will be riding a two-event winning streak when they arrive at Bristol Dragway on Friday to open the 16th annual Thunder Valley Nationals. Capps and the NAPA Dodge also have won the past two No. 1 qualifying positions, which is something he had never done in his career. Oh, and by the way, Capps’ third NHRA Wally trophy of the year Sunday moved the NAPA team into first place in the Mello Yello points standings for the first time since after the second event of the year that followed his season-opening win in February at Pomona, Calif.
“I almost felt embarrassed driving this car because it’s so good. Tobler and the NAPA Know How guys have given me such a good car,” said Capps, who expects his streak to continue at Bristol, where he has won three times in four final round appearances. He was the runner-up a year ago to teammate Matt Hagan. After becoming the first Funny Car driver to record all eight runs in the 3-second range at New England Dragway, the NAPA Dodge took less than 4 seconds to complete seven of his eight runs last weekend and the only time they fell short it was a 4.057-second run when his car lost an engine cylinder at the start. But Capps physical fitness training paid off through Sunday when he had to muscle the car to keep it in the traction groove while it was buffeted by stiff cross-track wind. The last thing Capps wanted, however, was to take any credit for the team’s unprecedented accomplishments. “It’s important to me that a lot of the credit goes not only to our NAPA team but also to the hard work by our guys at the DSR fabrication shop,” he said. “We’re having a lot of success because of our fab shop, Tobler and John Medlen’s vision and machining skill,” Capps said of Medlen, an assistant crew chief for DSR’s Infinite Hero team who is the primary innovator for DSR’s four Dodge Charger R/T Funny Cars. “They put their heads together and come up with great ideas.